This review is a little different than my others, I have opted out of the “what is not so great about this product” part of the review because frankly, I have never had any problems with any of the Dermalogica range. The Skin Prep Scrub is the only manual scrub that I have ever used that does not leave my skin a lovely shade of “painful red”. Which is surprising because the grains are quite large, and you can really feel the scrubbing action when using it. I love the way that my skin looks the day after using this product. It literally glows. I love it, and I’m certain that I will repurchase this once I’ve run out of the trial size. My favourite thing about this toner is the gentle tingling sensation that it leaves on my skin. I also like the fact that despite my clumsiness and ability to somehow get any product I use on my face IN MY EYES it doesn’t sting or aggravate in any way. It leaves my skin feeling cool, refreshed and ready for my moisturiser. It has a very faint smell, but it’s nothing offensive (and is surprisingly hard to describe). The bottle seems to last forever too, despite the fact that I am quite generous with the product, and use it every day. The Climate Control Lip Treatment is a life saver for me when I travel. It’s small enough to be carried around with you wherever you’re going (including on international flights), and packs a heavy moisturising punch right where you need it… On your lips. It is fragrance free, and sinks straight into lips to provide moisture, and protection from the elements. Great for anyone who works in an air conditioned office (like myself) and finds that their lips dry out during the day. Sample: Precleanse – Hello, most amazing product ever. I love Dermalogica Precleanse. I am actually at the point now where I can’t wash my face at night without using it, because my routine never feels complete! It is an oil cleanser that is a pre-cleansing step to do before using your actual skin cleanser. (hence the name precleanse, ha.) You rub the oil onto dry skin, dampen hands, rub your hands over your face to active the product (it will turn into a white film on your skin) and then rinse off. The Precleanse is really great in helping remove sunscreen or makeup before getting down to the nitty gritty cleansing stage. Sample: Skin Refining Mask – This mask is a lifesaver. I always have a second tube stored away in my cupboard incase I run out! I use this mask in skin emergencies, it never fails to clear things up for me. It is really gentle (another product from the range that does not aggravate my skin in any way) and leaves my skin glowing after use. I would recommend Dermalogica products to anyone considering trying a new skin care brand. 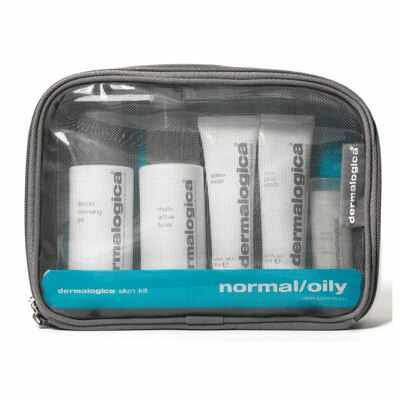 So please head on over and check out the Dermalogica product range available from Adore Beauty. (Adore Beauty ship to all locations within Australia & most of their products can also be shipped internationally.) What are you waiting for? GO NOW! I think I may try that scrub…I’ve been hunting for a good one for a while now! Thanks for the tip! The scrub lasts for ages! I still have some left in the trial sized tube. I like the sound of the precleanse, esp since i am a huge fan of oils. I had a Dermologica facial a while ago which i thought was average but am always happy to retry when someone else raves about a brand…My skin is dry so I am incredibly fussy with mositurisers and cleansers…they all seem to be made for the oily skinned! Lucky for me, I am one of the oily skinned ones! I really thanking you for providing very important idea about very good skin kit. I am in desperate need of some good skin care products. After reading your review I am going to purchase this kit. I have tried every product under the sun, hopefully this is the one!